The Best Illinois Blogs from thousands of Illinois blogs on the web using search and social metrics. Subscribe to these websites because they are actively working to educate, inspire, and empower their readers with frequent updates and high-quality information. Illinois newsletter is a comprehensive summary of the day's most important blog posts and news articles from the best Illinois websites on the web, and delivered to your email inbox each morning. To subscribe, simply provide us with your email address. Chicago, IL About Blog Chicago Tribune is your source for Chicago breaking news, sports, business, entertainment, weather and traffic. Considered an industry leader in journalism and innovation, Chicago Tribune Media Group has grown into a multi-product, multi-channel news and information leader. Facebook fans 577,492. Twitter followers 1,057,211. Chicago IL About Blog The Golden Girl is a Chicago based Fashion blog covering various topics including Style, Travel, Beauty, Lifestyle, Recipes, Holiday, Food & Drinks reviews and more. Facebook fans 3,404. Twitter followers 2,227. Champaign, IL About Blog The News-Gazette is your source for news and advertising in East Central Illinois. Facebook fans 29,837. Twitter followers 40,069. San Francisco, CA About Blog Follow us to keep up with articles on Illinois from Reddit . Facebook fans 1,207,728. Twitter followers 573,511. Belleville, IL About Blog The Belleville News is the leading source of news in Southwestern Illinois. Find daily local breaking news, opinion columns, videos and community events. Facebook fans 56,604. Twitter followers 11,963. Chicago, IL About Blog Sportsanista is a Chicago fashion blog that shares affordable and accessible fashion finds, beauty tips and game-day fashion. Her blog started out as a platform for women who work in sports to gain inspiration on incorporating fashion in to their everyday. Facebook fans 1,308. Twitter followers 762. Champaign, IL About Blog The University of Illinois Press supports the mission of the university through the worldwide dissemination of significant scholarship, striving to enhance and extend the reputation of the university. Through its publishing programs, the Press promotes research and education, enriches cultural and intellectual life, and fosters regional pride and accomplishments. Facebook fans 2,609. Twitter followers 5,175. Facebook fans 86,196. Twitter followers 274,920. Springfield, Illinois About Blog Illinois REALTORS is the only advocate for private property rights at the Capitol in Springfield and in communities statewide. We stand for excellence in advocacy, education and ethics for real estate practitioners. Facebook fans 9,439. Twitter followers 14,554. Chicago, IL About Blog Style Plus Curves is a Chicago plus size fashion blog celebrating plus size style, clothes, and shopping. Facebook fans 9,345. Twitter followers 2,558. Chicago, IL About Blog Dave Scriven-Young is a Chicago environmental attorney in the law firm of Peckar & Abramson, P.C. His mission is to work hard on behalf of his corporate and individual clients to obtain the best possible result in the most cost-effective manner. He will be there to protect your interests. Champaign, IL About Blog IllinoisLoyalty.com is an independent fan site devoted to the glory and heartbreak that is Illini sports. Facebook fans 1,540. Twitter followers 22,455. Springfield, Illinois About Blog The mission of the Illinois Manufacturers’ Association has been to strengthen the economic, social, environmental and governmental conditions solely for manufacturing and allied enterprises in Illinois to enlarge the business base and increase employment opportunities. Facebook fans 921. Twitter followers 1,069. About Blog Our Peoria criminal defense attorney handles cases involving drugs, domestic violence, etc. Our lawyer also handles family law cases for Illinois fathers. Chicago, IL About Blog Clark and Stone is a source for inspiration that covers fashion, food, travel, lifestyle, and kiddos. This blog is all about showcasing the things she love, that keep her going, and finding balance outside of being a mother to Clark and Stone. You will also find posts specifically related to the kiddos and wellness. Facebook fans 1,147. Twitter followers 65. Urbana, IL About Blog Illinois Field Crop Disease started as the first Department of Agronomy in the United States. Currently, they are nationally-ranked plant sciences program with a rich history and exceptional academic reputation. Urbana, IL About Blog The American Library is the world’s oldest and largest national library association and was established in the summer of 1973. While the archives are most useful for modern American intellectual, cultural, and social history, they contains research material for the educator, political scientist, sociologist, economist, and journalist. It is especially strong in the history of science and technology, agriculture, architecture, athletics, librarianship, education, and student. Facebook fans 474. Twitter followers 2,029. Urbana, IL About Blog The Illinois History and Lincoln Collections located in the Main Library at University of Illinois Urbana Champaign. They preserves and provides access to both print and manuscript materials documenting the history of Illinois as well as the life and legacy of Abraham Lincoln. Printed volumes include local histories, directories, atlases and contemporary works. Facebook fans 125. Twitter followers 327. Urbana, IL About Blog University of Illinois Admissions assists prospective students with the application process and getting to know campus. Facebook fans 7,425. Twitter followers 4,841. Peoria, IL About Blog The Journal Star is the major daily newspaper for Peoria, Illinois and its surrounding area. Get the latest breaking news, sports, entertainment and obituaries. Facebook fans 57,184. Twitter followers 35,027. Springfield, IL About Blog ConcealedCarry.com is a network of firearm instructors across the country, an online store of firearm accessories, and a media outlet for the firearm industry. Chicago, IL About Blog Follow us to keep up with articles from AdaptiBar Blog. Facebook fans n/a. Twitter followers 782. Chicago About Blog Welcome to the Illinois College of Optometry Library, where our collections, resources, and services are expressly tailored to meet the needs of our optometry students, faculty, residents, clinicians, and alumni. We offer many spaces to study and do research, as well as to relax. Facebook fans 4,918. Twitter followers 2,833. Union, IL About Blog The Illinois Railway Museum is the largest railway museum in the United States. It's mission is to educate the public as to our nation’s railroad and railway history by collecting, preserving, and restoring rolling stock, artifacts, structures, and related transportation equipment for display to the public; exhibiting and operating restored rolling stock. Facebook fans 22,593. Twitter followers 595. Naperville, IL About Blog IllinoisHighSchoolSports.com covers Illinois high school sports in detail, from article links to message boards to schedules and scoreboards. It also awards yearly scholarships to graduating student-athletics. It has awarded over $50,000 since we started the scholarship program. Facebook fans 3,172. Twitter followers 451. Marengo, IL About Blog Franks Gerkin McKenna stands for justice, we are the equalizers. Personal Injury, Workers Comp, Family Law, Criminal Defense, Bankruptcy, Business Law, and more. Our firm's mission is to continuously earn our reputation as a leader in the legal community through our caring commitment to our clients by representing their legal rights with experience and integrity. Facebook fans 1,636. Twitter followers 14. Bolingbrook, IL About Blog Accel Entertainment is licensed as a Terminal Operator by the Illinois Gaming Board and focuses on video gaming with an expertise unsurpassed in the industry. News and best practices for bars, restaurants and other establishments using slot machines and amusement to increase their revenue in the Illinois Gaming Market. Chicago About Blog ChicagoStyle Weddings Magazine & Website has provided couples with comprehensive wedding planning information and interactive tools to assist you in organizing your wedding. We strive to help you select the professional wedding vendor that is just right for you and your budget. ChicagoStyle Weddings provides you with all the necessary resources that are ultimately focused on the same goal - making it easier to plan your dream wedding. Facebook fans 14,636. Twitter followers 4,156. Chicago, Illinois About Blog Levin & Perconti is a nationally renowned law firm concentrating in all types of serious injury, medical malpractice, nursing home, and wrongful death litigation. Our personal injury attorneys are committed to protecting and indicating the rights of people who are seriously injured by the negligence of others. Facebook fans 670. Twitter followers 2,707. Illinois About Blog Delta Dental of Illinois has been dedicated to improving the oral health of the communities it serves. Their mission is to provide exceptional service to our stakeholders and improve the oral health of the communities we serve. Facebook fans 23,733. Twitter followers 3,214. Illinois About Blog The Illinois Poison Center is a non-profit health service that provides comprehensive and trusted information and treatment advice on potentially harmful substances via a free, confidential 24hr. Facebook fans 12,655. Twitter followers 1,035. Chicago, IL About Blog Welcome to Illinois Workers Compensation Law blog by Michael J. Helfand. He started his own law firm because he recognized that the way injured workers were hiring attorneys did not make sense. They deliver customer service and straight talk. CHICAGO, IL About Blog Helen Berkun is a creative director, photographer, fashion stylist, and influencer currently residing in Chicago. she has run the gamut from editorial and advertising photography to celebrity styling and commercial print. Facebook fans 2,750. Twitter followers 3,558. Chicago About Blog A Lily Love Affair is A Chicago based fashion & lifestyle blog by Anna Baun. It is a place you can come to be inspired not only by fashion and trends, but other aspects of life as well – style, beauty, home decor, family, and travel. Facebook fans n/a. Twitter followers 3,708. Barrington, IL About Blog Retirement Matters helps people of all wealth levels plan for their retirement. It helps you for transition to your ideal retirement, Financial Planning, Investment Management, Tax Review and Preparation in Barrington. Facebook fans 98. Twitter followers 2,431. Woodridge, IL About Blog Team Illinois is one of the most respected Tier I, AAA Hockey Organization in Illinois. It participates in the finest, most competitive AAA league in the United States as well as the most prestigious tournaments in North America. Facebook fans 1,618. Twitter followers 2,029. Illinois About Blog The Illinois GIS Association is the only statewide organization of GIS/geospatial professionals in Illinois. It advances the understanding, communication, and effectiveness of geospatial technology in Illinois. It connects over 500 members working in local, regional, state and federal government, higher educational institutions, and private industries. Chicago, IL About Blog Nottage and Ward has excelled in negotiation and litigation of complex family law matters throughout Illinois since 1988. It balances each client's unique, immediate, and emotional needs with a realistic assessment of the client's future financial requirements. Facebook fans 76. Twitter followers 690. Chicago, Illinois About Blog Divorce blogger and attorney Michael Roe is experienced in dealing with high-conflict divorce and child custody cases involving psychological disorders. With his divorce blog, He wants to simplify divorce processes and make life better for parties going through a divorce. Facebook fans 25. Twitter followers 52. Chicago, Illinois About Blog Levin & Perconti is a nationally renowned law firm concentrating in all types of serious injury, medical malpractice, nursing home, and wrongful death litigation. Our personal injury attorneys are committed to protecting and vindicating the rights of people who are seriously injured by the negligence of others. Chicago About Blog Follow us to keep up with updates from Ilinois Politic Blog. Facebook fans 45. Twitter followers 833. Lincolnshire, IL About Blog At Hedeker Law in Lincolnshire, Illinois, our lawyers are ready to assist you with all of your estate planning needs. It is an independent firm that helps families grow, protect and pass on their hard-earned money. Facebook fans 57. Twitter followers 1. Quincy, IL About Blog Arts Quincy was founded in 1947. Arts Quincy works to foster, strengthen and expand the language, visual and performing arts, and Arts-in-Education. It’s programs provide arts in education opportunities for area students, insure cost effective arts services for everyone, and attract new dollars to our local economy from local, regional, and national foundations and corporations. Facebook fans 3,115. Twitter followers n/a. Chicago, Illinois About Blog TASC (Treatment Alternatives for Safe Communities) is a nonprofit organization that advocates for cost-saving criminal justice interventions that maintain public safety while providing necessary clinical services for people with substance use and mental health problems. Illinois About Blog DF Design Inc was founded in 1991 with a mission to create beautiful spaces that customers love. There goal is to design home environments with a look and feel that goes well beyond the ordinary and sets you apart. Facebook fans 277. Twitter followers 286. About Blog Follow us to keep up with updates from Illinois Spotlite News. Springfield, Illinois, USA About Blog Illinois State Genealogical Society is a non-profit, educational organization established in October 1968. It's mission is to stimulate an interest in the people who contributed to the establishment and development of the State of Illinois and to seek, preserve, and make available data pertaining to individuals, families, and groups who lived in Illinois and to events which took place therein. Facebook fans n/a. Twitter followers 1,847. Springfield, Illinois About Blog The Caucus Blog shares news and information from the Illinois House Republicans serving in Springfield Illinois. Facebook fans 6,473. Twitter followers 15,635. About Blog Follow us to keep up with updates from Exploresavanna Illinois. Libertyville, Illinois About Blog Libertyville Divorce Attorney Ronald L. Bell & Associates P.C. handles family law, personal injury, criminal defense and business matters. He and Associates focus on Illinois Family Law. He knows how to establish the value of your business, any size small or large, for the sake of achieving equitable property division in a divorce. Facebook fans 228. Twitter followers 44. Chicago, IL About Blog Milk and Honee was started in 2012 as a means to share her's journey through motherhood. Here you will find weekly posts in the areas of faith, life, style, travel and motherhood. Facebook fans 577. Twitter followers 764. Chicago, Illiniois U.S.A. About Blog Welcome to the Chicago Business Attorney Published by Chicago Illinois Business Attorneys Bellas & Wachowski. They help business owners to solve and avoid problems, and protect their assets and families. Facebook fans 793. Twitter followers 1,129. About Blog The art of fly tying, through the exchange of ideas, information and practical experience. Chicago, IL About Blog Paramont EO and its retail division Crest Lighting are at the forefront of technological innovations that are altering the Chicago lighting landscape. Facebook fans 57. Twitter followers 251. 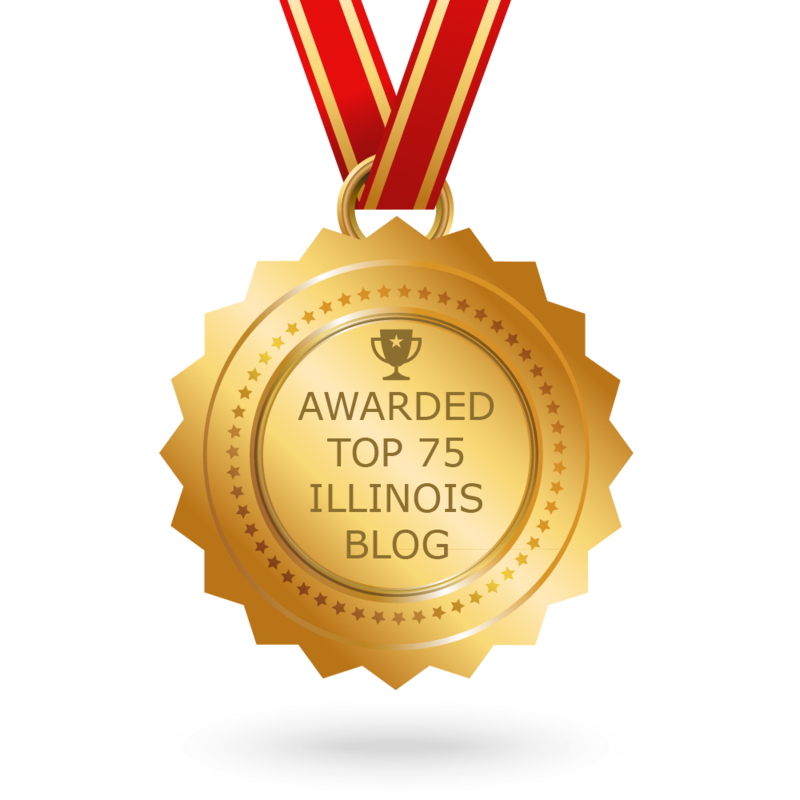 CONGRATULATIONS to every blogger that has made this Top Illinois Blogs list! This is the most comprehensive list of best Illinois blogs on the internet and I’m honoured to have you as part of this! I personally give you a high-five and want to thank you for your contribution to this world.